Ages 2.5 through 5. 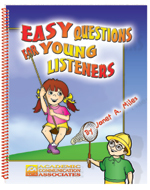 Each lesson in this book includes a short story, an illustration, and questions to ask the child. The stories are approximately 50 words in length. The questions can be asked during the presentation of the story or following completion of the story. These questions target specific concepts and language structures. The activities help parents develop questioning strategies that will facilitate growth in children's oral communication. Place the story picture in front of the child and introduce the story characters. Read the story to the child. Read the story a second time, pausing following each sentence to ask a question. If the student demonstrates the attention skills necessary to listen to the entire story without distractions, the questions can be asked after the entire story has been read. Ask the child to retell the story. Present the language expansion activities that follow the story. Reproducible worksheets are included for each of the activities.